(Last Updated : 07.01.2019). HTET Solved Question Paper 2018 Previous Year Paper with Answer Key - Check and download here free pdf solved question paper of HTET i.e. Haryana TET Exam for level 1, level 2 & level 3. Candidates who are appearing in recent HTET 2019 Exam held in January 2019 can check and search here HTET Solved Paper of previous years for all three levels - HTET JBT Solved Question Paper, HTET TGT Solved Question Paper & HTET PGT Solved Question Paper. Candidates can download TET Solved Paper 2018 Previous Year Solution as subject-wise, exam-wise and year-wise. Check and download here latest solved question papers of Haryana TET Examinations for TGT, PGT & JBT. Last year question paper solution of HTET Level 1, Level 2 & Level 3 are available here to download. 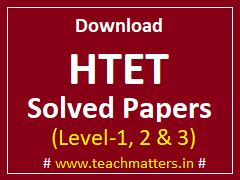 Previous year HTET Paper Solution has been uploaded here subject-wise (TGT & PGT), year-wise and level-wise/exam-wise. Solved Paper Download links are given below.